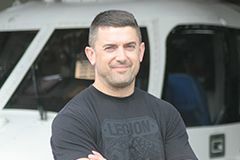 His PhD research will help advance the paramedicine profession, says health sciences alumnus Dr Paul Davis. “In New Zealand, paramedicine is an emerging discipline and critically under-researched. Evidence to inform paramedic practice is scarce, necessitating generalising from other areas of healthcare practice which is often considered in a de-contextualised manner. Paul’s PhD research focused on testing a new autonomous paramedic-based model of care for the treatment and management of heart attack patients in the New Zealand out-of-hospital setting. He collaborated with a number of high-profile health organisations for his research. “My doctoral research provided an opportunity to work in collaboration with New Zealand’s largest ambulance provider, St John; the Northland, Auckland and Hawke’s Bay District Health Boards; and the country’s leading interventional cardiology department at Auckland City Hospital. He enjoyed the support and structure provided by AUT throughout his postgraduate study, Paul says. Being able to share his work with other health professionals was one of the highlights of Paul’s studies.